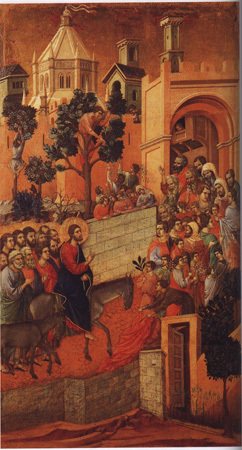 Duccio di Buoninsegna (active 1278-1318) was the principal painter in Siena, Florence's major rival at the beginning of the fourteenth century. Duccio's work presents a significant alternative to the style of Giotto. 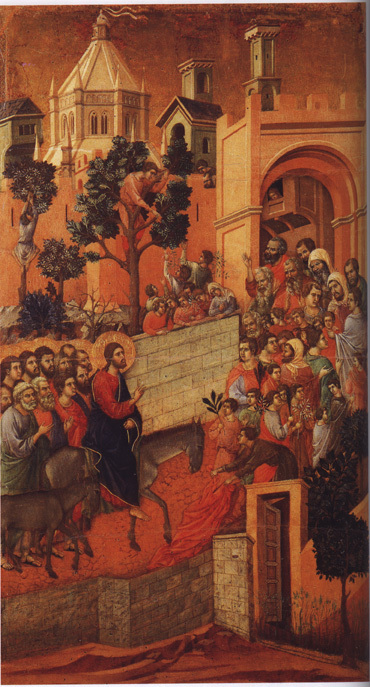 Just as Giotto will dominate the Florentine school for much of the rest of the fourteenth century, Duccio's style will dominate Sienese art. A good way to get a grasp of the different styles is to compare Giotto's Ognissanti Madonna to Duccio's Rucellai Madonna. 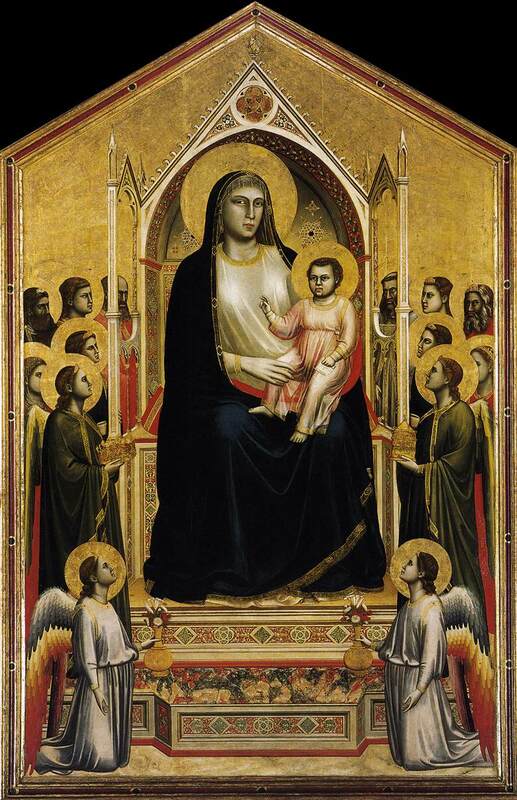 Ironically the Rucellai Madonna was apparently commissioned by the Society of the Virgin Mary, or the Laudesi, in Florence. The work was later incorporated into the Rucellai family chapel in the church of Sta. Maria Novella in Florence. 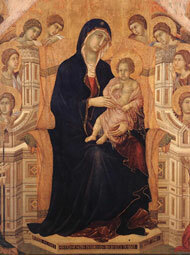 Remember that this work is currently hung in the same room as the Ognissanti in the Uffizi. 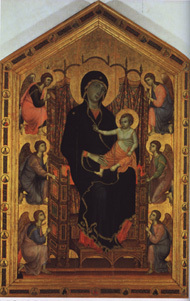 Duccio, Rucellai Madonna ,c. 1285. 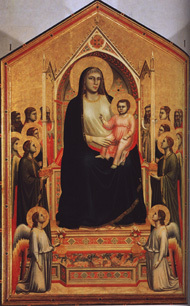 Giotto,Ognissanti Madonna, c. 1305-10. 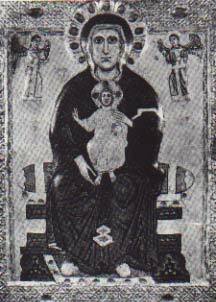 At this time the altarpiece for the high altar was finished and the picture which was called the "Madonna with the large eyes" or Our Lady of Grace, that now hangs over the altar of St. Boniface, was taken down. Now this Our Lady was she who had hearkened to the people of Siena when the Florentines were routed at Monte Aperto, and her place was changed because the new one was made, which is far more beautiful and devout and larger, and is painted on the back with the stories of the Old and New Testaments. And on the day that it was carried to the Duomo the shops were shut, and the bishop conducted a great and devout company of priests and friars in solemn procession, accompanied by the nine signiors, and all the officers of the commune, and all the people, and one after another the worthiest with lighted candles in their hands took places near the picture, and behind came the women and children with great devotion. And they accompanied the said picture up to the Duomo, making the procession around the Campo, as is the custom, all the bells ringing joyously, out of reverence for so noble a picture as this. 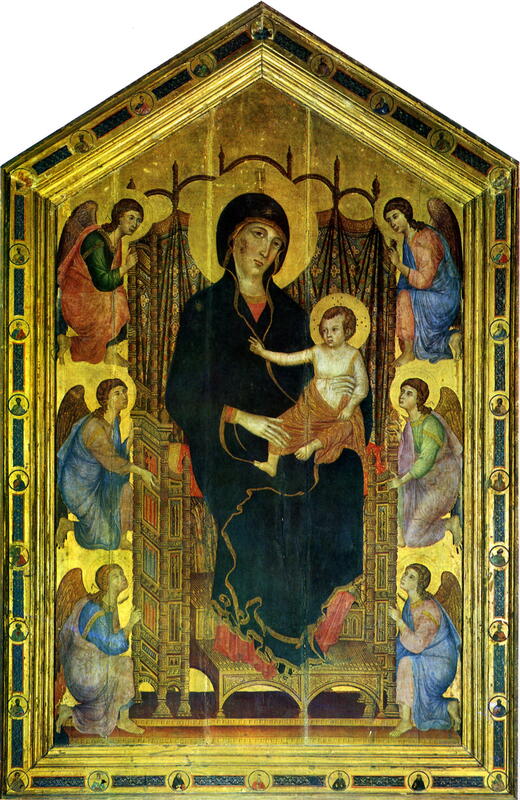 And this picture Duccio di Niccolò the painter made, and it was made in the house of the Muciatti outside the gate a Stalloreggi . 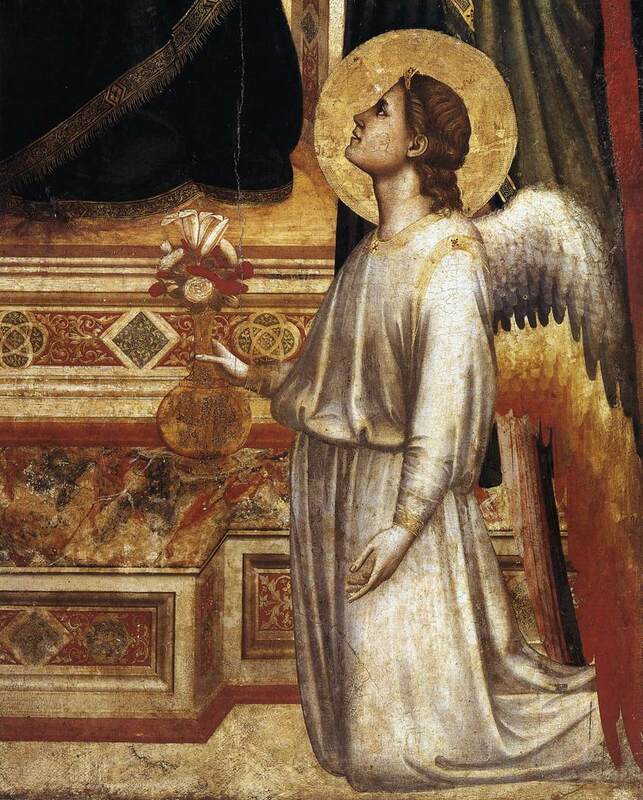 And all that day persons, praying God and His Mother, who is our advocate, to defend us by their infinite mercy from every adversity and all evil, and keep us from the hands of traitors and of the enemies of Siena. This account reminds us how we should remember the integral role of a major work like this in the civic life of the city. Notice also how the adoration devoted to this new image is comparable to that shown the relics of a patron saint of a community. It is important to remember that the Virgin was the patron saint of Siena, and as such she was the center of the civic and religious life of the city. 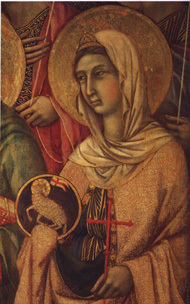 Kneeling beside the throne of the Virgin are the other patron saints of Siena: Ansanus, Sabinus, Crescentius, and Victor. 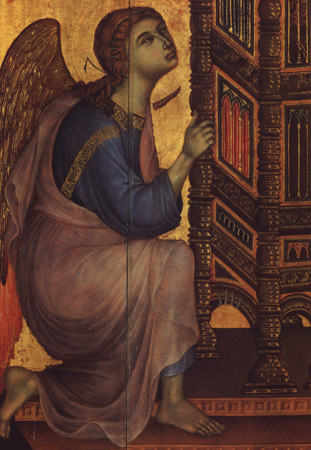 The order of the altarpiece and the privileged position given to the Sienese saints, especially the Virgin, would have been clearly understood to reflect the ideal order of the city of Siena which would stand before it in the Duomo. 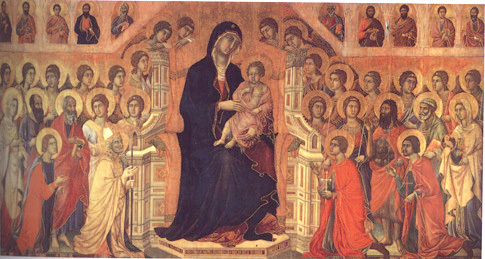 The civic implications are further brought out by the original inscription: HOLY MOTHER OF GOD BESTOW PEACE ON SIENA AND SALVATION ON DUCCIO WHO PAINTED THEE. 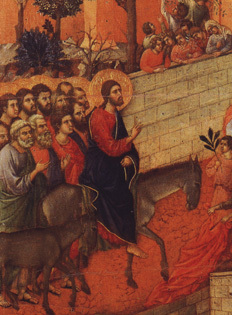 Compare the Duccio's Maestà to his earlier Rucellai Madonna and to Giotto's Ognissanti Madonna..
Duccio, Entry into Jersusalem, from the back of the Maestà. 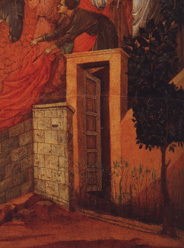 1308-11. 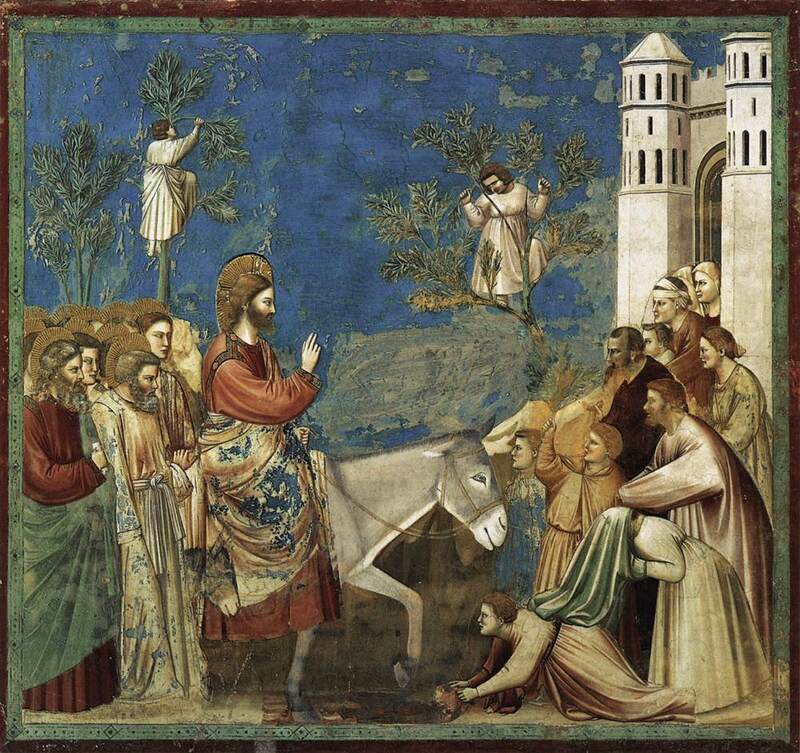 Giotto, Entry into Jerusalem, from the Arena Chapel, c. 1305. 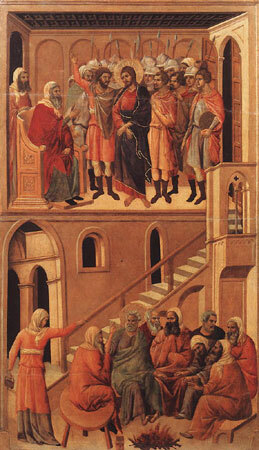 Christ before Annas and the Denial of St. Peter.